We will work together to promote our sports in a fun and collaborative manner. After a successful joint Ballsports Expo between Cricket and Baseball we decided that we could all benefit from helping each other to put on fun, well supported events rather than each struggling to increase our support base. 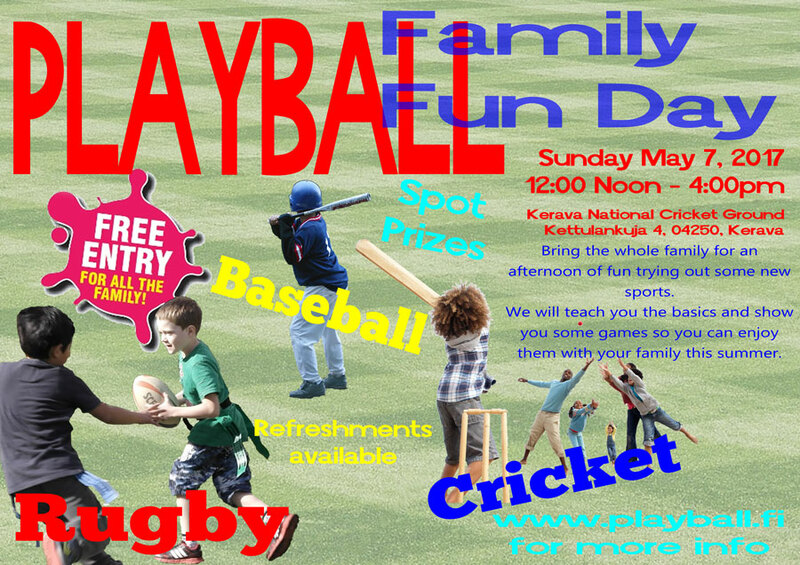 So our first event kicks off on Sunday May 7th, 2017 at Kerava National Cricket Ground, where we will host a Family Fun Day from 12:00pm to 16:00pm. You are invited to bring your family along and try out some new sports, we will provide all the equipment and have coaches on hand to show you how each of the sports are played and introduce you to some fun family versions of our sports you will be able to play in the park or at the beach this summer.